There’s a joke going around that asks: "Where’s the best place to hide a dead body?" The answer: "On the second page of a Google search." It underscores the fact that if your technical content is difficult to find, it might as well not exist. Customers want to find answers, not search for them. As professional communicators, it's our job to utilize effective search engine optimization (SEO) techniques designed to help ensure prospects and customers can find the right answers quickly. Optimizing content for findability is a necessity regardless of whether your content is publicly available and indexed by Google, or protected behind a customers-only documentation portal. 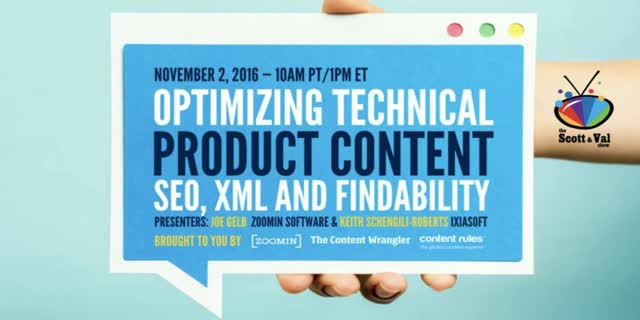 Join Val Swisher, Founder, and CEO of Content Rules and co-host for the Scott and Val Show, for this free, one-hour web discussion with DITA Specialist Keith Schengili-Roberts of IXIASOFT, and dynamic content delivery guru Joe Gelb, President of Zoomin Software. The presenters will discuss content optimization and share practical strategies for enriching technical product content and improving findability, while enhancing the customer experience. While there are several mechanisms built into the Darwin Information Typing Architecture (DITA) that are designed to make it easy to find content for reuse, a successful SEO strategy for technical content requires more. Creating a taxonomy and inserting descriptive metadata into your DITA maps and topics is a good start, but this is only the beginning of effective SEO for DITA-based technical content. Attendees can expect to discover techniques that can be used to make DITA-based content easy for your users to find.